Barnadown Run is situated on the red Cambrian clay loam (terra rossa) of the Mount Camel range in Toolleen, 20 kilometers north of Heathcote. The Heathcote region in central Victoria clearly produces robust, good red wines with the power and finesse for which the district has become known over the past three decades. Named after the original pastoral lease which encompassed the property, Barnadown Run has a small annual production and our premium wines have won a number of awards. Increasingly more and more people and becoming aware of Barnadown Run. Traditional wine making techniques are used and we produce ten varieties of wine, both red and white, still and sparkling. Our cellar door is usually open, but it is better to make an appointment first should you wish to enjoy a tasting of a particular red wine for sale. Some of Australia's finest wines bear the Heathcote name on their labels and the wines are highly sort after for their cellaring potential. 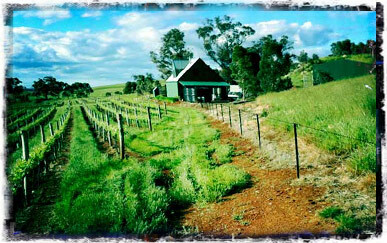 Established on rich terra rossa soil for which the best Heathcote vineyards are famous, owner Andrew Millis carries out both the viticulture and winemaking at the 5-hectare vineyard. We invite you to explore our current release of affordable, boutique red wine online via the Our Wines link at the top of the page. You can buy red wine online via the Shop Online link.